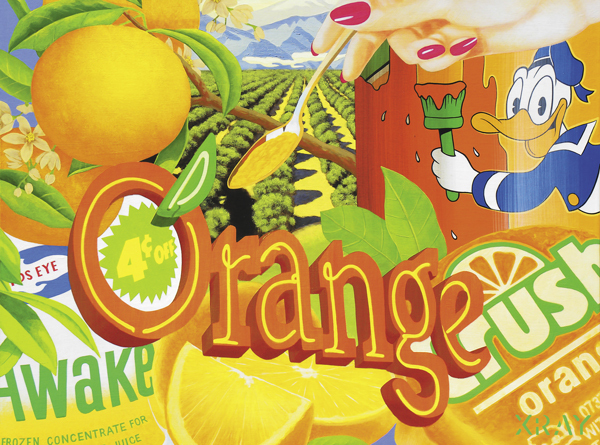 With its orange blossoms, splashes of juice, Faygo soda, Tang, Sunshine Kool-aid, creamsicles, orange wedges, groves, and fruit on the tree, and Donald Duck orange-washing a fence, XRAY’s Orange Series is a visual fantasia, a meditation on the artist’s youth in Florida and an idealized, tropical brand of Americana that never truly existed. The promise of Florida has always been better than its swampy, overdeveloped reality. The paintings combine a hyper-realistic painting style with a seemingly impromptu composition that uses the visual language of collage to throw an endless, happy galaxy of appropriated brands and imagery at the viewer. The naivety is delivered with such vivaciousness, XRAY’s paintings seem to ask, What is behind this waterfall of forced happiness? 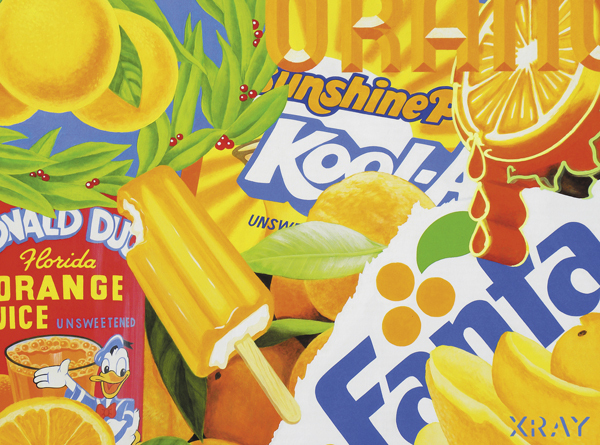 If we think of these paintings as a representation of Florida–a place that obscures its dark realities with bright, shiny, colorful distractions–and ultimately a metaphor for American consumerism in general–the attractive branding and advertising washing over the sinister reality, these paintings are polemic reminders that things aren’t always as they seem. Prints of XRAY’s Orange Series are also available for purchase HERE. Based in Montreal since 2008, by way of Orlando, Florida, XRAY is a street and fine artist who has exhibited widely in group and solo shows in Quebec and Florida. In the past few years, he has exhibited at Fresh Paint Gallery, Station 16, Galerie D, and L’Espace Créatif in Montreal and at the Vintro Hotel & Kitchen’s Pop-up Gallery in Miami. He has participated in a number of live painting events: Just for Laughs, Fresh Paint, and DÉCOVER Magazine’s “Expo les Refuses”. His installation work can be viewed in Montreal at Fresh Paint and Attraction Media. XRAY also works commercially, collaborating with clients including Toyota, Vans, Car2Go, and Disney. Active on the public mural scene, he took part in the 2013 Free For All Walls project in Windsor, Ontario and the 2014 MURAL Festival in Montreal. He also received “Best Kiosk Award” at the 2014 Festival International Montreal en Arts. His work is part of several collections in Canada and The United States.